The daily administration of the program is primarily funded by South Carolina Department of Labor, Licensing and Regulation. Every local fire department and community stakeholder will determine their own personal and financial commitment level. 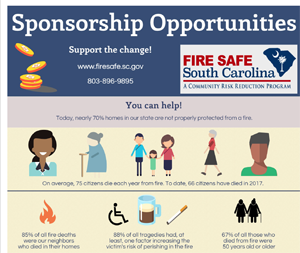 Leading fire service organizations will contribute via their time and funding but will also be responsible for acquiring grants to support statewide strategic community risk reduction programs. Together, we anticipate funding sources for residential alarm installations to be a major need.